Processes involving sand and dust transport play an important roll in shaping the landscape and the ecosystem of the Mojave region. Barren rock, alluvium, and dry lake beds are all sources of dust and sand. Typically most dust (clay and silt) becomes suspended in the wind and is carried away from the region by prevailing winds, particularly during wind storms when high dust concentrations in the air can create near "white-out" conditions. In contrast, wind moves sand along the surface as a saltating bedload. The moving sand will stall and accumulate as dunes where the wind rises over a barrier (such as a mountain range). However, for dunes to persist, a sand source area must provide a sufficient flux of new sand, otherwise both wind and running water will remove sand faster than it can accumulate, and therefore, prevent dune development or cause existing dunes to diminish or even vanish. 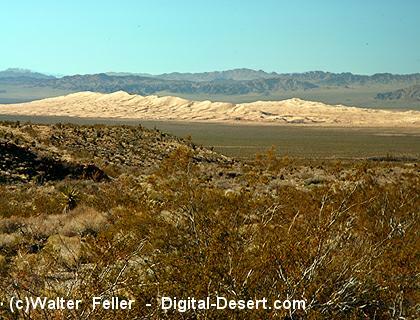 The Kelso Dunes and Devils Playground is a large area of eolian (wind blown) sand deposits within the Mojave National Preserve; the dune field is also the largest in the Mojave Desert region. The dune field contains dunes (both actively-forming/migrating dunes and plant-stabilized dunes), sand sheets (sandy flats areas transitional between the source areas and the dunes), and sand ramps (sand build-ups on the flanks of the mountains). The dune field is are located in the southeastern end of the greater Soda Lake-Kelso basin where the Granite Mountains and southern Providence Mountains form a barrier to prevailing winds. Wind entraining a flux of sand derived mostly from the Mojave River area at the western end of the basin is deposited near the rising mountain front of the Granite and Providence Mountains, causing the coarser fractions to accumulate. The changing climate of the Quaternary (wet to dry, and reverse) has influenced the formation, stabilization, destruction, and re-activation of dune field systems through time. The Kelso Dunes probably looked much different during the wet periods of the Quaternary than they do today. In fact, field evidence suggests they may have been mostly or entirely stabilized by plant cover in the past, much as the great dune field of the Sand Hills of Nebraska are stabilized by vegetation today. Lake sediments constitute one of the major sources for eolian sediment, along with sediments derived from lower (distal) alluvial fans and ephemeral washes (such as Mojave River for the Kelso Dunes field). Investigations have demonstrated that at least two major pulses of dune emplacement occurred between 35,000 to 25,000 and 15,000 to 10,000 years before present, and a period of active dune reworking and construction has been ongoing for most of the past 4,000 years (Tchakerian and Lancaster, 2002; Lancaster and Tchakerian, 2003). These are times of dramatic increase in sediment supply from drying lakes and river input. The size, character, and extent of dune fields depend on many variables that determine the supply and mobility of eolian sediments. Factors include source materials, wind direction and magnitude, precipitation patterns, and landscape (geospatial) configurations relating to sediment supply, migration paths, and depositional setting. During wet periods, vegetation cover stabilizes dunes, leads to soil formation, and curtails eolian sediment supply from source regions ( playas, washes, fans, etc.). Conversely, during arid periods these source regions are re-activated. In addition, the extent of ancient Lake Mojave during highstands in lake levels in the Quaternary may have isolated Kelso Dunes from their sediment source area. However, the linkage between climate and dune re-activation is not clearly resolved. When dry periods persist, the supply of sediment provided by streams may cease, and the readily wind-transportable material may diminish. As a result, sand dunes may erode away due to lack of the supply of new sand, and desert pavements may form. The probable most effective climate for sand dune field formation is a balance of episodic, intense storms (to generate and move sediments to eolian source areas) with intervening windy, long, hot, dry periods (to hinder soil development and plant growth). For every bucket of sand that migrates into the Kelso Dunes, an undetermined volume of dust is generated that disappears into the wind. Dust storms in the Mojave region can be quite intense, and a hazard when dust concentrations are high enough to cause white-out conditions. Windblown dust can be harmful to people breathing it. Dust may contain toxic compounds and it can carry pathogens such as the virus that causes Valley Fever; it also carries away valuable topsoil. On the otherhand, dust that settles into stony soils of the desert provides improved retention of moisture and adds nutrients. Thus, dust can be both beneficial and destructive.